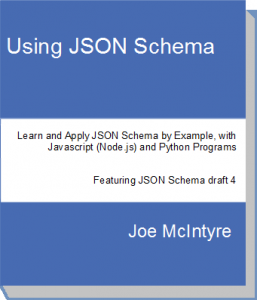 Using JSON Schema is a Book and GitHub project, showing how JSON Schema can be used for a variety of tasks and in different programming contexts. To work with the book examples, and try out your own JSON schemas, the online JSON Validate tool allows you to interactively create, edit and test JSON content and JSON Schema definitions. The Import menu gives you easy access to the examples in the book. Go to jsonvalidate.com to use the tool. To download the book (iBookstore, ePUB and PDF editions) and the accompanying materials for the book, head to the Downloads page. Aug 4, 2014 Why isn't my $ref working?